CARFAX Certified 1 Owner No Accidents Fully Serviced QUALITY CERTIFIED up to 10 YEARS 100,000 MILE WARRANTY This Jeep includes: TRANSMISSION: 9-SPEED 948TE AUTOMATIC (STD) Transmission w/Dual Shift Mode A/T 9-Speed A/T ADVANCED TECHNOLOGY GROUP Lane Departure Warning Back-Up Camera BLACK MY SKY POWER/REMOVABLE SUNROOF Generic Sun/Moonroof Sun/Moonroof Dual Moonroof ENGINE: 2.4L I4 MULTIAIR (STD) 4 Cylinder Engine Gasoline Fuel 6.5 NAVIGATION GROUP W/UCONNECT WiFi Hotspot HD Radio Navigation System AM/FM Stereo Satellite Radio Bluetooth Connection Telematics Auxiliary Audio Input MP3 Player SKI GRAY/BARK BROWN, LEATHER TRIMMED BUCKET SEATS Leather Seats Bucket Seats *Note - For third party subscriptions or services, please contact the dealer for more information. 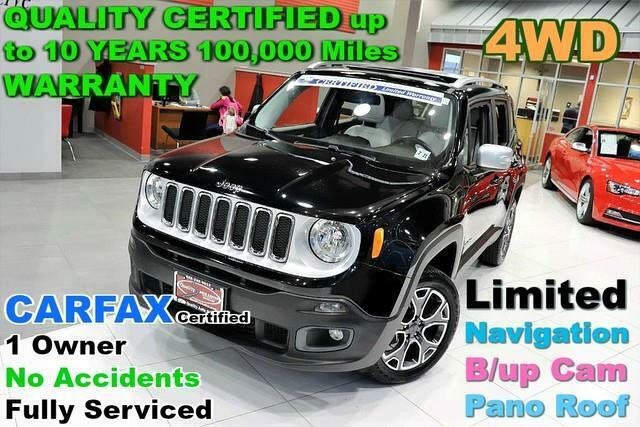 * This well-maintained Jeep Renegade Limited 4WD - comes complete with a CARFAX one-owner history report. This Jeep Renegade Limited 4WD - is an incredibly versatile vehicle that is a must have for any family. This 4WD-equipped vehicle will handle beautifully on any terrain and in any weather condition your may find yourself in. The benefits of driving a 4 wheel drive vehicle, such as this Jeep Renegade Limited 4WD -, include superior acceleration, improved steering, and increased traction and stability. A Jeep with as few miles as this one is a rare find. This Renegade Limited 4WD - was gently driven and it shows. Intricately stitched leather and ergonomic design seats are among the details in which test drivers say that Jeep Renegade is in a league of its own You'll see the world in a whole new way thanks to the navigation system that comes with this vehicle. This vehicle includes important services and maintenance records, so you can feel more confident about your buying decision. If not for a few miles on the odometer you would be hard-pressed to know this 2016 Jeep Renegade is a pre-owned vehicle. Price. Performance. Protection. This vehicle has it all, including a manufacturer's warranty. You will never have to worry about keeping up with traffic in this Jeep Renegade as it packs a beast under the hood. Equipped with many extra features, this well-appointed vehicle is a treat to drive. The paint on this Jeep Renegade Limited 4WD - is flawless no scratches, no blemishes, no need to spend extra money on touch ups. The Jeep Renegade Limited 4WD - is exactly what you would expect out of a Jeep. It's decadently opulent, meticulously engineered and unapologetically grandiose. Equipped with upgraded wheels, this Jeep Renegade is stunning to see driving down the street. More information about the 2016 Jeep Renegade: The Renegade is an important vehicle for Jeep. It's the first time they've ever committed to building what they call a small SUV. Jeep has been building compact SUVs for a while, but now they truly have a vehicle that doesn't just work in the city, but thrives there. Renegade pricing starts at under $18,000, significantly cheaper than the MINI Countryman which is roughly the same size. This model sets itself apart with available 4-wheel drive, low base price, Compact dimensions, good fuel economy, lots of optional equipment, and short wheelbase for easy parking No Credit / Bad Credit / No Paystubs, No problem !! ! All Approved ! Everyone drives ! CLEAN, GORGEOUS, LOW MILES, SHOWROOM CONDITION. CALL NOW QUALITY CERTIFIED up to 10 YEARS 100,000 MILE WARRANTY , To Certify a vehicle, there will be an additional cost for Certification. CALL NOW For details. STUNNING AGGRESSIVE LOOK ON THIS BEAUTIFUL--Call today to schedule a test drive... Good Credit/Bad Credit/No problem!!!! Get paid cash? No problem!! 100% Credit Approval with interest rates starting at 2.49% for qualified customers, our rates will not be beaten. We price our cars at wholesale price to guarantee the best deals for our customers. Our inventory moves quick, please call to confirm the availability of the vehicle of your interest Springfield location 973-564-0112. This vehicle is located at our SPRINGFIELD location. Come visit our new showroom in Springfield NJ. Contact Quality Auto Center today for information on dozens of vehicles like this 2016 Jeep Renegade Limited. Do so much more with one vehicle. This Jeep Renegade gives you everything you need an automobile to be. Where do you want to go today? With 4WD, you can choose to drive virtually anywhere and on terrain 2WD vehicles can't handle. This low mileage Jeep Renegade has barely been touched. It's the next best thing to buying new. More information about the 2016 Jeep Renegade: The Renegade is an important vehicle for Jeep. It's the first time they've ever committed to building what they call a small SUV. Jeep has been building compact SUVs for a while, but now they truly have a vehicle that doesn't just work in the city, but thrives there. Renegade pricing starts at under $18,000, significantly cheaper than the MINI Countryman which is roughly the same size. Strengths of this model include available 4-wheel drive, low base price, Compact dimensions, good fuel economy, lots of optional equipment, and short wheelbase for easy parking No Credit / Bad Credit / No Paystubs, No problem !! ! All Approved ! Everyone drives ! CLEAN, GORGEOUS, LOW MILES, SHOWROOM CONDITION. CALL NOW QUALITY CERTIFIED up to 10 YEARS 100,000 MILE WARRANTY , To Certify a vehicle, there will be an additional cost for Certification. CALL NOW For details. STUNNING AGGRESSIVE LOOK ON THIS BEAUTIFUL--Call today to schedule a test drive... Good Credit/Bad Credit/No problem!!!! Get paid cash? No problem!! 100% Credit Approval with interest rates starting at 2.49% for qualified customers, our rates will not be beaten. We price our cars at wholesale price to guarantee the best deals for our customers. Our inventory moves quick, please call to confirm the availability of the vehicle of your interest Springfield location 973-564-0112. This vehicle is located at our SPRINGFIELD location. Come visit our new showroom in Springfield NJ.